Samyang 14mm Ultra Wide Angle f2.8 canon EF fit lens STUNNING! Canon FD 100mm 2.8 1983 - LOVELY! Canon 58mm. Fish Eye Wide Angle Lens. This is a used Nikon NIKKOR 20mm f/2.8 AF lens, in very good condition, U/V filter. Classic AF Nikkor construction and styling. Super Integrated Coating (SIC) anti-reflective coatings prevent lens flare and ghosting. The super multi-layer coating reduces flare and ghosting and provides high contrast images throughout the entire zoom range. This Ultra wide-angle zoom lens has a maximum aperture of F3.5 throughout the entire zoom range, making it suitable for low-light and indoor photography. EX Sigma For Nikon 10-20mm 1:4-5.6 DC HSM Wide Angle Zoom Lens With Case. Condition is lightly used but excellent. Coming from original owners very clean, pet & smoke free home. Dispatched via Royal Mail 2nd Class. Serial: 71D2832. DX Format, no motor. Zoom is smooth all across the range. Focus is smooth all across the range. Is close to new condition and although is being sold as used it probably has had minimum use. Nikon Nikkor AF-P DX 10-20mm F/4.5-5.6 VR G Lens (Black). Samyang (Rokinon) 12mm f/2.8 ED AS IF NCS UMC Fisheye Lens for Fuji mount. It is manual focus and there is a traditional aperture ring. This lens is nothing short of excellent optically. This lens is a stereographic fisheye. YONGNUO Yn35mm EF Fixed Prime Lens F2 AF MF Wide Angle Canon EOS. Condition is used though have only had this a few months so is in excellent condition. Samyang 2.8/14mm Ultra Wide Angle Lens ED AS IF UMC for canon . Hardly used and in great condition. This Sigma 10mm-20mm is an amazing landscape lens. It's makes no difference to the workings of the lens and has no impact on image quality or usability. Lens is in mint condition no visible marks on lens missing view finder but boxed with instructions. A beautiful little fisheye lens, in near perfect condition. Brand new, bought on advice it would work with my FX Nikon, turns out it does not. Not even taken out of the box Nikon Nikkor AF-P DX 10-20mm F/4.5-5.6 VR G Lens (Black). Condition is New. Dispatched with Royal Mail 1st Class. 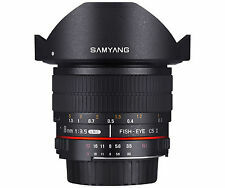 Samyang 7.5mm. The outside of the lens is slightly buffed where the lens cap slides onto the body of the lens. This is normal wear for this type of lens and in no way affects the quality of function of the lens. No visible marks/scratches and in excellent working order. JINTU 8mm f/3.5 HD Fisheye Lens with Removeable Hood for Canon EOS DSLR Camera. Condition is Used. Dispatched with Royal Mail 2nd Class. Very little used, and about a year old, health issues prevent me from walking much hence photography limited so selling some equipment. As far as I can tell it still CBD with no obvious defects. This is a new account as upgraded to a business account, I have 2 both with good feedback. My other accounts are commercial-bargains which I mainly use for buying and magicherb_co_uk which has about 450 positive including some photo equipment I recently sold. I have the box as in photos though it's a bit today so will take a couple of areas. Any questions let me know. Condition is Used. Dispatched for FREE. Excellent lens, wide angle. Crisp and perfect for interior shots or wide landscape shots. NIKON AF-S MOUNT SIGMA 10-20MM F4-5.6 D DC HSM WIDE ZOOM LENS. The autofocus is free and smooth as is the zoom. This highly rated and sought after Nikon AF-S zoom lens is in excellent condition and is in full working order. Tokina AT-X 11-16mm f2.8 PRO DX (Nikon mount). 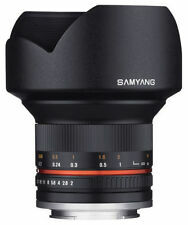 The Samyang 14 mm T 3.1 features exceptional optical performances and an excellent value for money. Even when used at the maximum aperture of T 3.1, the image quality is very high. It's a great lens for both professional and amateur videographers. Anyone that knows this lens will know the optics are very prone to balsam faults, dull spots, fungus etc. The lens shows very fewsigns of use as per the images. The focus is free and smooth. The internals are haze, dust and fungus free. 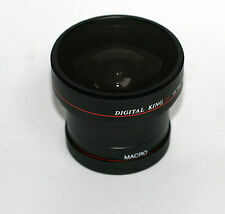 Mint SAMYANG AE 14mm f / 2.8 ED IF UMC wide angle Lens - for Nikon. NIKON AI-S NIKKOR 20MM F2.8 WIDE ANGLE LENS. Separation does not normally affect the image but we have tested the lens extensively on a D800 and can confirm this is the case here, this has no effect on the image whatsoever. VERY GOOD NO SCRATCHES,HAZE,FUNGUS OR OTHER OPTICAL IMPERFECTIONS. Features: 7artisans 12mm F2.8 Ultra-Wide-Angle Lens features 10 elements in 8 groups to provide better control optical defects. High quality optical glass with multi-layer coating helps to avoid the flare, stay high contrast to the edges. With 7 diaphragm blades, you can get pleasing bokeh in the blur background of your pics. 7artisans 12mm F2.8 is made of aluminum metal body, weighting 0.65lb/295g, which makes it durable, compact and lightweight. Widely support for Fujifilm X-A1 X-A10 X-A2 X-A3 X-AT X-M1 X-M2 X-T1 X-T10 X-T2 X-T20 X-Pro1 X-Pro2 X-E1 X-E2 X-E2s Specifications: Compatible Camera Mount: Fuji X-mount. I have not taken this out of the house, I bought it about a month ago and as good as it is, I went and got a 16-35 so this is redundant. Great lens! Nothing that affects lens functionality. 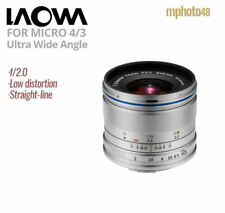 Laowa 15mm f/4 1:1 Wide Angle Macro Lens - NIKON. Dispatched with Royal Mail Signed For® 2nd Class. This is a brand new lense only tried it once, just dont like it for my style of photography, it is boxed in perfect condition no dust scratches or wear and tear, box is also in mint condition and has warranty card etc. Irix 11mm F4 Firefly Ultra Wide Angle Lens. Canon EF Mount. Outstanding high quality ultra-wide angle lens. Lens is in excellent condtion. Optics perfect. A few marks on lens hood where protection cap slides on/off. This particular lens is a 'Lens Doctor' conversion from the original Canon FD mount to Canon EF with focus confirm and variable aperture. This rare and highly regarded Canon FD mount manual focus wide lens is in excellent condition and is in full working order. AF 14mm F2.8 Lens. SLIGHTLY USED BUT IN PERFECT WORKING CONDITIONS! NO SCRATCHES AT ALL! MINT CONDITION! The cap for it has a slight crack (see picture above) but other than that, this item is in great condition. The Sigma 10-20mm F3.5 EX DC HSM is an ultra wide-angle zoom lens has a maximum aperture of F3.5 throughout the entire zoom range, making it suitable for low-light and indoor photography. It’s wide-angle of view from 102.4 degrees produces striking images with exaggerated perspective, enabling photographers to emphasise the subject.